As our lives grow increasingly digitized, more and more valuable and irreplaceable things reside on our computers. For instance, I have 15,000 digital photos, nearly 4,000 songs, a dozen or so movies, all of my family’s financial data, and countless personal and professional documents. Losing any of it would be an unpleasant experience, to say the least. So backing up my files is vitally important to me. But backing up data isn’t a one-size-fits-all proposition—what works for you will depend on the types of data you want to protect and, more important, how worried you are about keeping that data safe. I’ve based these recommendations on what I think will bring most people peace of mind, but you know yourself—and your data—best. Use the guidelines to figure out your own plan, as you consider how much time and money you’re willing to spend, as well as how worried you are about losing files. Why? If you’ve got OS X 10.5, you’ve already got Time Machine, and it’s fairly easy to use. You do need an additional hard drive that’s at least one and a half times bigger than the amount of data you want to protect. An external drive, a network-attached storage (NAS) device, or Apple’s wireless Time Capsule ( ) will do the trick. Looking for an external hard drive or NAS to use with Time Machine? Our storage slideshow has several recommendations, based on storage devices we've reviewed this year. Once you hook the drive up and enable Time Machine, you can usually just let it do its thing. Time Machine keeps multiple copies of your files, making it easy to revert to an older version. It also protects against the most common way for files to be lost: accidental deletion (unless you delete the file within an hour of creating it). Pick What to Protect If you don’t do anything, Time Machine will back up just about every file on your hard drive. While this works well, it means you’ll use a lot of drive space to back up system files and applications, which you (most likely) already have copies of on disc. You can tell Time Machine to skip these files. Freeing up this space will leave more room for copies of your data and media files, although it will mean that you’ll spend more time getting your machine set back up if your drive crashes. 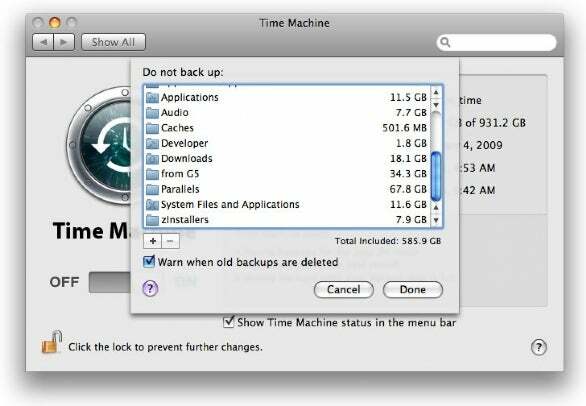 If you exclude easily replaced files from your Time Machine backups, you'll have more room on your backup drive for critical files that change often. Get up and running after a disaster If your hard drive dies and you’ve got a Time Machine backup, restoring your files is pretty simple. After plugging in your new hard drive, you’ll use the OS X installation disc to install the system. While you’re doing that, you’ll be offered the option to restore from a Time Machine backup. This may be all you need to do to get up and running. However, if you’ve excluded system files and applications, you’ll need to break out your program discs and download OS X updates after the basic system installation is done. What if you want data protection, but you also need to get up and running quickly after a hard-drive crash? If you use your Mac for work, you may not be able to waste a day or two recovering from a computer meltdown. You may also be concerned about protecting your data against theft or natural disaster. In this case, I recommend using Time Machine and adding a couple of extra safety measures. Create a clone To get back to work quickly in the event of a hard drive crash, I recommend creating a clone (or copy) of your boot disk. If you do so on a set schedule, you’ll ensure that you have a regularly updated copy of the system; I update mine once a week. Two programs can help: Bombich Software’s Carbon Copy Cloner (payment requested; ) or Shirt Pocket’s $28 SuperDuper ( ). Both of these programs create an exact clone of your system that you can use as a startup disk. You’ll need an external (or internal, if you have a Mac Pro) hard drive specifically for your clone—because it will be big. If your primary hard drive fails, plug in your clone, press and hold the option key when you start up your Mac, choose the clone from the drive-selection screen, and start working immediately. Once you’ve replaced the dead hard drive, use your cloning software to copy your backup (which you’ve been using as the primary drive) onto the new drive. Reboot from the new drive, and you’re almost back to where you began; however, you’ll need to use Time Machine to restore the latest versions of any files you updated after your last clone was made. You can speed up the process of creating your clone by excluding files that you’ve got backed up elsewhere or that you won’t need while you’re temporarily working from the clone. I exclude the virtual machines for Parallels’ $80 Desktop for Mac ( ), VMware’s $80 VMware Fusion ( ), and Sun’s free VirtualBox ( ). I have these backed up elsewhere, and they’re huge files. Opt for off-site backups Combining Time Machine with a bootable copy of your data gives you a lot of protection against hard-drive failure, but it won’t help if someone steals your setup or if your home is destroyed by a fire or another natural disaster. If you want to protect against these events, you need to keep a backup of your files somewhere else. The easiest way to do this for all your important data is to invest in another external hard drive, bringing your total up to three (Time Machine, clone, and off-site backup). Use a backup program such as EMC Insignia’s $129 Retrospect 8, Prosoft Engineering’s $59 Data Backup 3, or Tri-Edre’s $69 Tri-Backup 5. Set up a once-per-week task to copy your key preferences, application support files, documents, and media files to the external drive. You then need to find somewhere to store this copy off-site. If you’re backing up your home Mac, just take the hard drive to work. Alternatively, you might ask a neighbor if to store it for you—but to protect against natural disasters, the farther the backup is from your home, the better. Once a week, bring home the off-site drive and run your backup. The next morning, return the backup to its off-site location. This solution has two flaws. The first is that your off-site drive is in your home one night a week. If that happens to be the night of the great flood, you’re in trouble! The second problem is that you can lose a week’s worth of data if a natural disaster occurs on the day your drive is scheduled to come home (because you’ll lose anything you’ve worked on since the last off-site backup was run). If either or both of these limitations set you on edge, you should consider moving up to Worry Level 3. Does it make you nervous to think about losing even a week’s worth of data or having your off-site data at home for even one night a week? This final level offers the best protection—within budget and complexity constraints—against hard-drive failures and natural disasters. The objectives here are to better protect against a theft or a natural disaster, and to make sure you’ll lose as little work as possible if disaster strikes. I assume you’re already using Time Machine. I also assume you have a clone of your drive and a basic off-site backup plan. Add an additional off-site drive To greatly reduce the odds of a natural disaster taking out your data, add a second off-site drive to your backup rotation. That will bring your total to four backup drives: Time Machine, clone, and two off-site drives. If you use a Mac Pro, the clone and Time Machine can be internal drives, but you’ll need external drives for the other two. Set the second off-site backup drive to copy the same files as the first drive, but on a different day. So, if you currently have an off-site drive that comes back on Monday night, add another that comes back on Thursday night. With two off-site drives, you’ll always have at least one that’s protected in the event of a disaster—especially if they’re stored in different locations. (If you’re backing up a work computer, for instance, take one drive home, and send the other to your spouse’s office or a neighbor’s home.) Also, you reduce the amount of data you’d potentially lose to (in this example) three or four days’ worth. Add an online backup If that isn’t good enough, you can add one more step to the process: a regularly scheduled online backup of your really important files. This works best for small files that you modify often—work files or Quicken files, for example—and that you don’t want to lose any changes to. Many companies, such as Apple (through the MobileMe service ( ), Dropbox, and Mozy, will store your backup data on their servers. Typically, services allow you to use a certain amount of space (typically 1GB or 2GB) for free, and then charge per megabyte for additional space. If you want to protect media files—all your photos or a collection of videos, for example—you’ll probably find that most online backup services don’t offer enough storage space, and that uploading your 10GB of data would take many hours. You’ll probably want to settle for the backup copies you keep on your off-site external drive(s). You can choose the strategy (or the parts of these strategies) that’s right for you, after deciding how much you value your files. Given how rarely hard drives actually fail, even a simple Time Machine-only backup plan will protect your data reasonably well. While getting going with a backup plan may take some time and expense, the peace of mind that comes with knowing your irreplaceable digital files are well protected makes doing so worth the effort.